I'm a late bloomer in the world of spirits but I've had a few scotch tasters lately and I've liked most of them. I had a few BevMo gift cards saved up so I thought I'd sample a few different brands. How'd I do in picking out some standards to try? Any good recommendations for scotch beginners? Glenmorangie, Balvenie, Glenlevet, Aberlour, McCallen all great picks. I'll stick to butterscotch, lol. i like Macallan 12 and Cask Strength. the 18 is too high now. before the craze it was very well priced and i would splurge from time to time. now it is about a third or higher more. Gary, some good recommendations above. What appeals to your palate? Sweeter whiskies - try Highlands or Speysides. Smoky / peaty - try Islays. More earthy with hints of salt - try Lowlands. Your photo shows a wide spread of sweet to smoky (Glenlivet, Glenfiddich and Macallan are Speysides - sweeter; Laphroig is from Islay - smokey (the peat they use to fire their kilns imparts the flavor heavily into the whisky). Try them neat and then add a small amount of water - a few drops - and sip again. Or do what Longhorn does: Melt an ice cube under the spigot until its the size of a quarter and then throw it in. He taught me that trick! This is right on the mark. Identify the flavor profile you like - Highland/Speyside - some of which can be dry or sweeter if they're aged in sherry casks or the like - or smoky, peaty Islay and go from there. It's like going from a Connecticut stick to a strong maduro. Longhorn - 1/6/2019 9:54 PM Gary, some good recommendations above. I would take a slightly different approach to answering your question by asking a question: What appeals to your palate? Sweeter whiskies - try Highlands or Speysides. Smoky / peaty - try Islays. More earthy with hints of salt - try Lowlands. Your photo shows a wide spread of sweet to smoky (Glenlivet, Glenfiddich and Macallan are Speysides - sweeter; Laphroig is from Islay - smokey (the peat they use to fire their kilns imparts the flavor heavily into the whisky). Try them neat and then add a small amount of water - a few drops - and sip again. Enjoy! Excellent advice! Getting into the world of Scotch is not for the feint of heart because of the varied properties of taste they have and when you add cigars in the mix of tastes it can overwhelm the user. Sipping the libation will help to introduce these tastes...diluting it with a splash of filtered water or small filtered ice is recommended as one eases into this practice to train your taste buds to accept it. If one has never really drank Scotch the opinions usually are described as tasting iodine...that hardly ever goes right afterwards when drinking it. Remember your first taste of whiskey???? I remember mine and thought somebody spiked it with cough medicine and then lit it on fire....ease into it and savor the overall flavor as good filtered water will brace your taste buds. If one has never really drank Scotch the opinions usually are described as tasting iodine...that hardly ever goes right afterwards when drinking it. Remember your first taste of whiskey???? I remember mine and thought somebody spiked it with cough medicine and then lit it on fire....ease into it and savor the overall flavor as good filtered water will brace your taste buds. Not to go off on a tangent, but why would you want to try something like this ever again? I've never understood the phrase "It's an acquired taste". I'm sure if you eat enough dog $hit you would develop a liking for it too! I did not like Scotch at first, but i'm a fan now. I like all of your chosen ones. And I will agree that Glen Morangie is worth a go, my favorite two are the Original and the Nector D'or. I like pairing different spirits with cigars. There is much good stuff out there to sample, including bourbons, dark rums, cognac, Irish whiskey, etc. Enjoy the journey. Make sure you give Monkey Shoulder a go. Blended Malt Scotch Whisky. It's no secret that the three malt components that form Monkey Shoulder's smooth, malty and fruity character are derived from William Grant's three Speyside distilleries: Balvenie, Glenfiddich and Kininvie. My definition of "Acquired Taste": A developed sense of taste for a particular thing developed over time, perhaps. Some things require more than one go at it to appreciate it. The blue veined cheeses tasted like vomit to me when I first tried them, but after small amounts disbursed through a dish, the complex tang became appealing. After that, eating it straight up was lovely. For some, olives may be found in this category, or bitter greens, or other sharp aged cheeses. The same applies to spices and the same goes for wine, spirits, beer and cigars no doubt. I never liked a double IPA in the long ago past, but by trying a variety of beers and not giving any one up just because the first time was not good is not enough of a reason not to try it again over time, and again, and again if needed. Why? Because by doing so you invite a larger spectrum of choices and experiences and discovery and adventure into your life, you acquire a taste for it, which in return bring me more satisfaction and happiness. Is this not the same with everything in life? 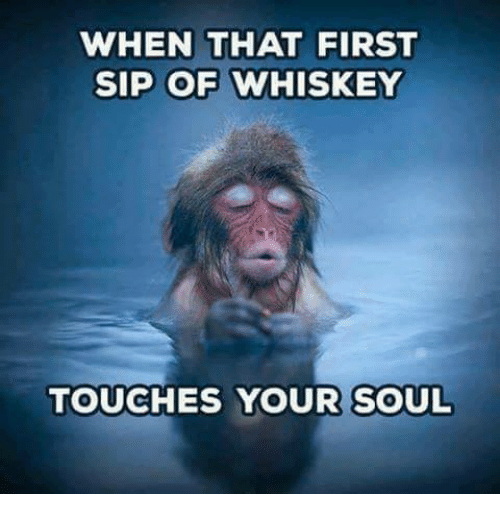 I personally would not get accustomed to dog s**t because it would be toxic and make you very ill.
Cigary - 1/7/2019 5:28 AM If one has never really drank Scotch the opinions usually are described as tasting iodine...that hardly ever goes right afterwards when drinking it. Remember your first taste of whiskey???? I remember mine and thought somebody spiked it with cough medicine and then lit it on fire....ease into it and savor the overall flavor as good filtered water will brace your taste buds. Tastes change esp. as we age...my point as to acquired tastes is this... If taste does not change then expect the same opinion you had with the original tasting. There are cigars that I just did not like early on but twenty years later I enjoy them quite a bit. Scotch just like any hard drink is a take-it-or-leave-it scenarioand if you don't like it from day one there's a good chance you're not going to like it until your taste change and accept the taste that is somewhat diluted. Remember that no two tastes are the same so you have to give some room for individuality and personal taste. Awesome advice all! Thank you! I did try to mix up the profiles in what I bought so I could see what it is I like better. This map at BevMo was really helpful in being able to tell what I might be in for with what I picked. I don't recall much of my childhood, or really anything from age 20 and prior - due to a traumatic motor vehicle accident. I enjoyed the first cigar I ever had, hence why I am still in this hobby. If I smoke something and don't care for it, I don't smoke it again. I had no idea, sorry man, talk about THE wrong example to use to make my point. No offense taken at all! I was just posting that my opinion is obviously not in the majority. Give the Glenlevet 15 year a try. They age it in Sherry Casks. It gives it a completely different taste profile (kind of a bourbon/ scotch hybrid flavor).